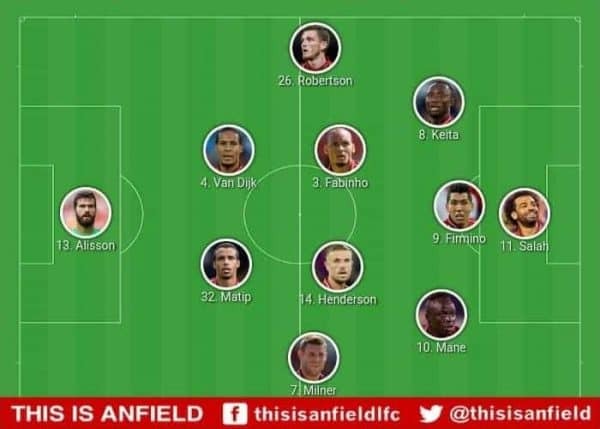 Liverpool set up against Crystal Palace with a nod to the formation which beat Man United. They had less control over the result, but still ground one out. Roy Hodgson bemoaned his side’s bad luck after the game, conceding deflected goals and one which he felt was handball in the buildup, but the Reds deserved the win when looking at the big picture, and it wasn’t necessarily a lucky one. The goals they conceded were not clear-cut chances for the opponents, although they were probably bigger chances than the xG has them down as. Teams need to win all types of game to win the title, and Liverpool triumphed here thanks to their tenacity and resilience, and the versatility of the squad—not least Roberto Firmino who played four different positions throughout the game, from right-back to centre-forward. Prior to each game Liverpool perform a warmup routine which provides a good idea of the shape they are going to play. 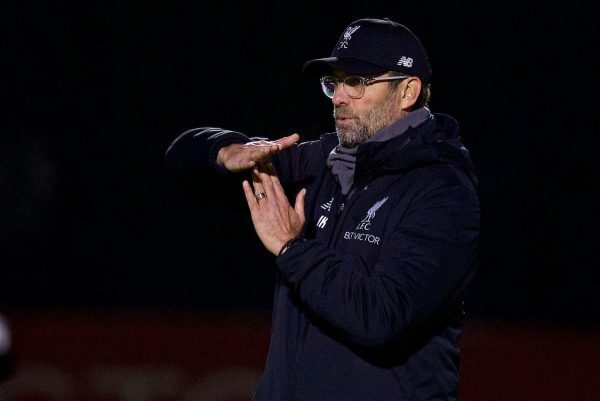 Jurgen Klopp spends the entirety of the pre-match session watching the other team, and maybe opposition staff should follow suit and pay attention to this section of the Reds’ routine. The full-backs stick to the wings, sending in crosses before practicing their shooting from the edge of the area. Before the game against Palace, the midfielders and the wingers lined up on each side of the ‘D’, with the right winger pairing up with the right midfielder, and the corresponding left-sided duo on the other side. Against Palace this was Fabinho and Naby Keita on the left, and Jordan Henderson and Sadio Mane on the right. Firmino and Mohamed Salah hang around in the middle, firing shots on the third-choice goalie—in this case, Caoimhin Kelleher. The centre-backs ping passes between each other separately from the rest of the team, completing this group of pairings. 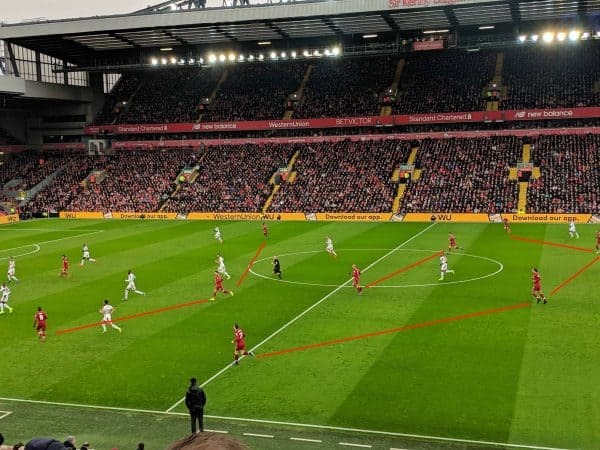 These duos are then each other’s reference points throughout the game, with the lineup of the players across the pitch as important as the one which goes up and down it. Here, that was a fluid 4-2-3-1, which had Keita on the left of the three (more on that later) and Mane on the right, but they were fairly narrow in the first half with the width coming from the full-backs, as emphasised in that pre-game drill. There was a narrowness to the game in the first period. 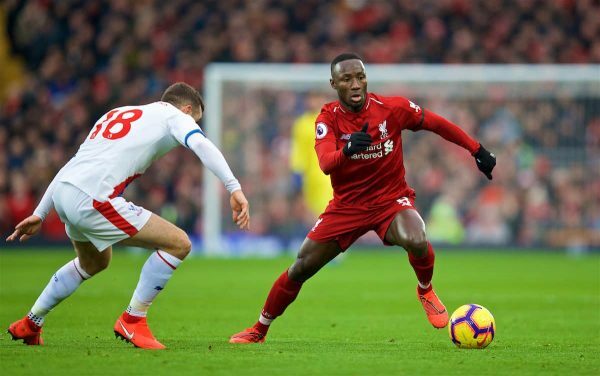 Palace defend within the imaginary lines which extend from each edge of the 18-yard box, meaning Andy Robertson and James Milner were often free, but they were the only wide threats with Keita and Mane rarely pushing on to the byline. Liverpool had three players on the pitch who had previously played out wide, but there were no wingers in this game. And they appeared stifled. Between them Salah, Firmino, Mane and Keita only had 13 touches in the opposition area in the first half. However, this doubled in the second half to 26. “We were extremely dominant in the first half, but we were 1-0 down. “We created chances but not enough, maybe not clear enough. We didn’t have enough players in the decisive areas, we had a lot of players in the preparing areas. They appeared much more fluid in the second period, taking up much more dangerous positions against this well-organised opponent, but one player in this attacking foursome still struggled. Before he joined Liverpool, Keita had done his homework. He knew Liverpool’s tactics, and he knew how his team-mates operated. “I watched every match. It was going to be important for me. The way they played, the tactics, everything. “You are fulfilling a dream of coming to a massive club like Liverpool—it is normal you do as much as you can to prepare to be ready from the moment you arrive. “I suppose the people I concentrated on the most being a midfielder, and looking at things offensively, was Bobby, Sadio, and Mo. I knew Sadio from Red Bull Salzburg, but I would look at their movements. “They are all fast, skilful, comfortable on the ball; the speed of the two guys out wide means they want the ball in front of them quite often so they can get in behind. “Bobby likes to come a little deeper and join in, so he wants it to feet. This was not a player coming into an unfamiliar tactical setup, and at one point last season it even looked like Liverpool were preparing for Keita as much as he was preparing for them, using a formation similar to RB Leipzig’s 4-4-2/4-2-2-2. 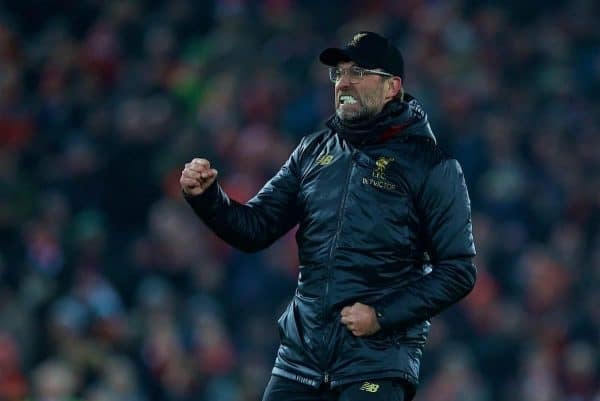 Against Palace, it was at times a hybrid of the Leipzig shape and the Klopp 4-2-3-1, although this wasn’t as pronounced as the game against United, and was much closer to the 4-2-3-1. 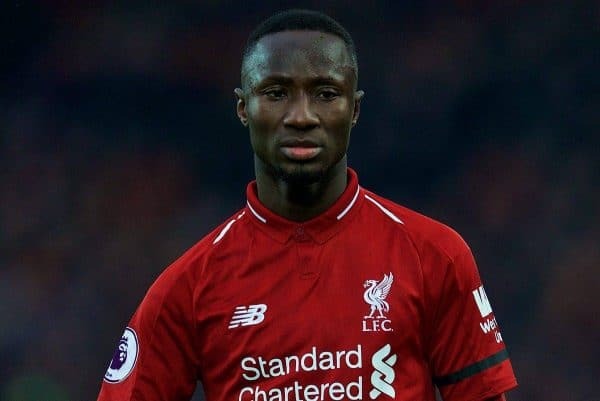 At Anfield, Keita played the role on the left of the three, or the left of the middle two, with Mane on the right. The problem here is that even if we see it as a 4-2-2-2, Keita is in the wrong two—if we take his position in the deeper-lying double pivot at Leipzig as his correct or most natural position. For Liverpool, this would mean him operating where Henderson or Fabinho played against Palace. Maybe Klopp doesn’t trust him enough, tactically, to use him there yet, but the rest of the team weren’t exactly disciplined for the first Palace goal, leaving a big gap between the high press and the back line. “He is a creative midfield player with discipline; tactical discipline is a big strength of his usually. He’s doing the right things in the right moment, that’s how good players are,” said Klopp before the start of the season. “At Leipzig, he played as a winger, that’s for sure not his best position but he can play it because he has the speed for it, he has the football intelligence for it. “We see him as a creative No. 8 playing the passes and making the runs with the ball. 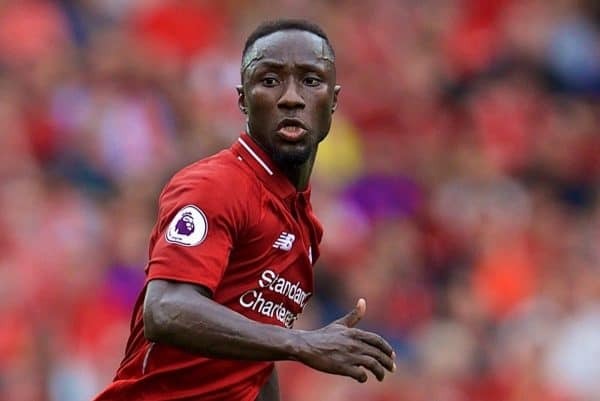 The defensive side of the game is still something Keita can excel in, and he’s an especially good presser, which in theory should be ideal for Klopp’s system. However, this wide position also means he is involved in less defensive work, and he is unable to turn defence into attack as regularly—to do that he needs to first be in a defensive position. In this current role he has less of the pitch in front of him, which can also lead to problems when defending in the other direction or tracking back. The image of Keita at Leipzig is one of a player winning the ball back in the centre of the pitch, bounding into the opposition half and making things happen in the final third. This football will-o’-the-wisp couldn’t be tracked down or stopped, but at the moment he can’t seem to get going. Once Klopp trusts him enough to drop him back into the double pivot, we should start to see the best of Keita. As we’ve seen with Robertson, Alex Oxlade-Chamberlain, and Fabinho, the wait during the bedding-in period is usually worth it. After the game, Hodgson said Liverpool were lucky to score the goals they did, and that his side deserved something from it. There is no doubt that Palace are a well-drilled unit who have a threat in attack in the shape of Wilfried Zaha which few sides in the low- to mid-table battle possess. He naturally targeted Milner with great success, and the stand-in right-back was eventually sent off having picked up two yellows, though any right-back would have struggled to contain Zaha. In theory, Rafa Camacho may have had a better chance of stopping him, but there was a risk of denting his confidence—a risk Klopp didn’t want to take as he might need him later in the season. 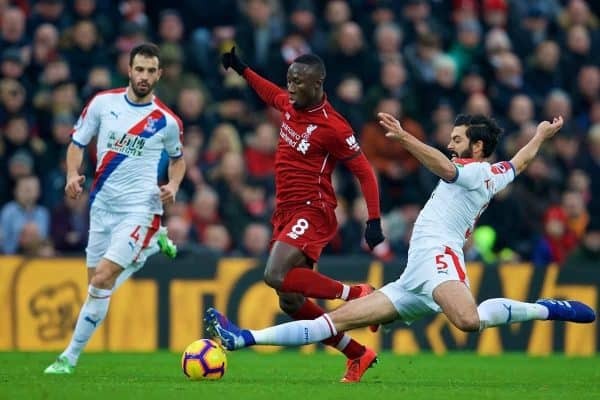 The Ivorian looks like a player who should be in a side aiming to qualify for Europe, and Luka Milivojevic is an underrated midfielder who will regularly find his attacking team-mate—as was the case for the first goal. They created no big chances compared to Liverpool’s three, with Joel Matip the only player not to make his count. Even if we take away Salah’s tap-in which was millimetres away from crossing the line following Julian Speroni’s error, Liverpool would still be ahead by around 1.80 goals to 0.80 on the various xG models. Seventy percent possession, 19-9 on top in terms of shots, and 9-3 for shots on target. The result was about right, even if the number of goals was perhaps higher than would have been expected before and after the match, especially in Palace’s case. It may have looked lucky, and especially so from Hodgson’s point of view, but in the second half Liverpool forced it. 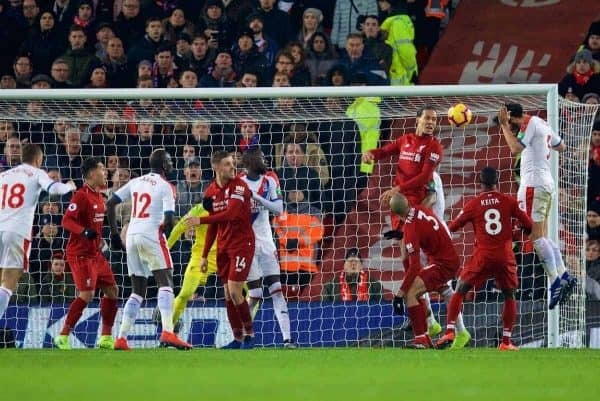 Palace were ruthless with the chances they did get, meaning Liverpool conceded three at home in one game having only conceded three at home all season prior to this in the league. Hodgson said Liverpool might learn from this slight scare, but it’s likely that this game didn’t tell them anything they didn’t know already. Though it will keep them on their toes ahead of next week’s game at home to Leicester.